We introduce a novel parametric BRDF model that can accurately encode a wide variety of real-world isotropic BRDFs with a small number of parameters. The key observation we make is that a BRDF may be viewed as a statistical distribution on a unit hemisphere. We derive a novel directional statistics distribution, which we refer to as the hemispherical exponential power distribution, and model an isotropic BRDF with a mixture of it. The novel directional statistics BRDF model allows us to derive a canonical probabilistic method for estimating its parameters including the number of components. We show that the model captures the full spectrum of real-world isotropic BRDFs with accuracy comparable to non-parametric models but with a much more compact representation. We also experimentally show that the model achieves better accuracy with less measurements compared with such non-parametric models. We further demonstrate the advantages of the novel BRDF model by showing its use for reflection component separation and for exploring the space of isotropic BRDFs. in Proc. of IEEE Twelfth International Conference on Computer Vision ICCV’09, pp476-483, Oct., 2009.
in OSA Journal of Optical Society of America A, vol.28, no.1, pp8-18, Jan., 2011. The goal of this paper is to derive a low-dimensional parametric BRDF model that can achieve accuracy comparable to nonparametric representations. That is, we aim to accurately express the wide variety of real-world BRDFs with an analytical model consisting of a small number of parameters. In order to make the problem tractable, we focus on isotropic BRDFs. Our approach to this challenging, long-standing problem is based on a novel perspective of a BRDF. 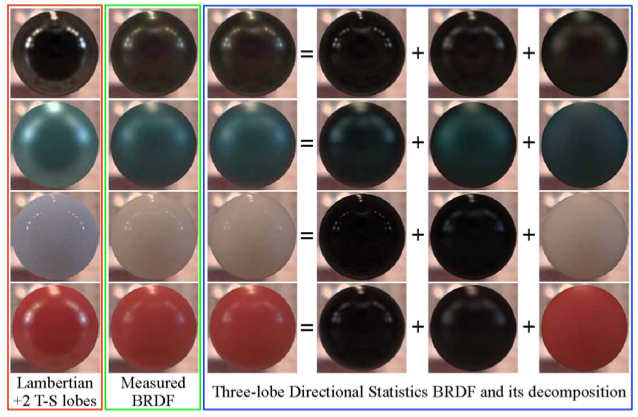 We view the BRDF as a directional statistics distribution, a probability density function that takes in an incident light ray direction and returns a distribution of reflected light ray directions. For this, we derive a novel directional distribution model defined on the hemisphere (not the sphere as in conventional directional statistics), (b) the hemi-EPD, which has a shape parameter \gamma in addition to the scale parameter \kappa that corresponds to the concentration of a (a) von Mises–Fisher distribution (shown as 1D profiles). The hemi-EPD model can represent a wide variety of hemispherical directional distributions (the corresponding colors represent different values of \kappa and the three distinct distributions in (b) are drawn with different values of \gamma for the same \kappa). We model real-world isotropic BRDF as a mixture of the newly derived hemispherical exponential power distributions (previous figure). The novel directional statistics BRDF model (DSBRDF) can encode the whole spectrum of BRDFs ranging from purely Lambertian to perfect mirror reflection in the exact same functional form. (a) DSBRDF model with three lobes (solid curve) fit to slices of different measured BRDF data (squares) shown as a 1D profile on the incident plane. The DSBRDF model accurately fits the measured data despite the dramatically different shapes of the measured distributions (RGB corresponds to RGB color channels). (b) Lobes (red, green, blue curves) of a three-lobe isotropic DSBRDF model (black solid curve) fit to measured data (black dots). Each lobe clearly captures a distinct characteristic reflectance component of the BRDF. The number of necessary lobes for accurately encoding the directional distribution of a real-world isotropic BRDF varies depending on the material. For instance, a simple BRDF that only exhibits diffuse reflection may be modeled with a single lobe, while BRDFs with exotic distributions may require more than three lobes, each representing different types of reflections ranging from a specular spike to a glossy specular lobe and a Lambertian lobe. We can automatically determine the optimal number of lobes by running the EM algorithm for different numbers of lobes, and then testing the quality of fits using a statistical measure (William’s statistical test). Each row shows spheres rendered using the original measured BRDF data and those rendered using the DSBRDF model with one to five lobes from left to right, respectively. The estimated optimal number of lobes for the DSBRDF models were 5, 4, and 2, respectively, which agree well with the visual quality of the rendered spheres. 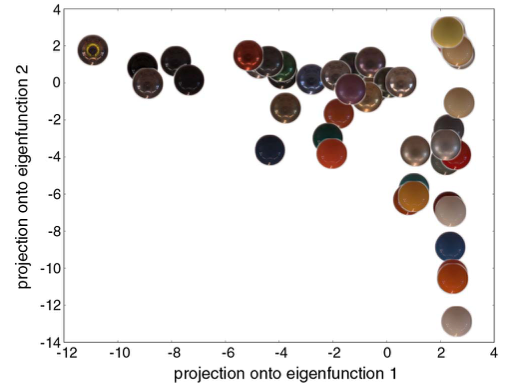 Relative RMS errors for all 100 MERL BRDFs using the DSBRDF model with the optimal number of lobes and synthetic spheres rendered with the (top) DSBRDF model and (bottom) measured data. 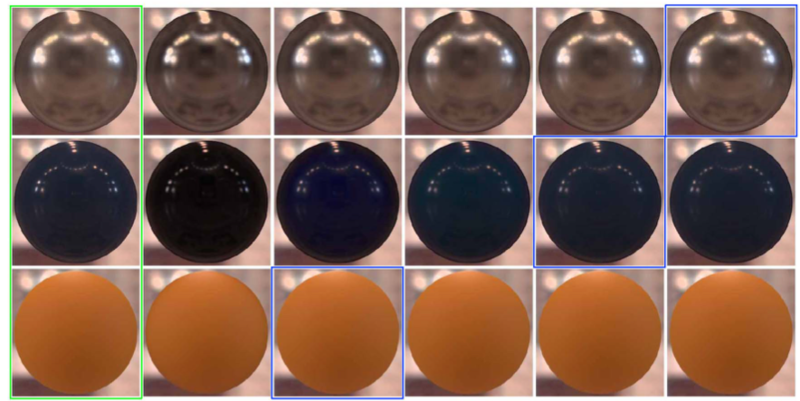 The large errors are mainly caused by subsurface scattering (see the left-most column); otherwise, the visual quality of the DSBRDF model is very high. Synthetic spheres rendered with the Lambertian model with two lobes of Torrance–Sparrow models, measured BRDF, three-lobe DSBRDF model, and first to third individual lobes of the DSBRDF model from left to right, respectively. The results clearly show that the conventional Lambertian diffuse plus Torrance–Sparrow specular reflection representation fails to capture the complex reflectance of these real-world materials that we encounter in our daily life, even with two Torrance–Sparrow specular lobes. On the other hand, the three-lobe DSBRDF model accurately reproduces the appearance under natural illumination, which validates its expressiveness and accuracy. 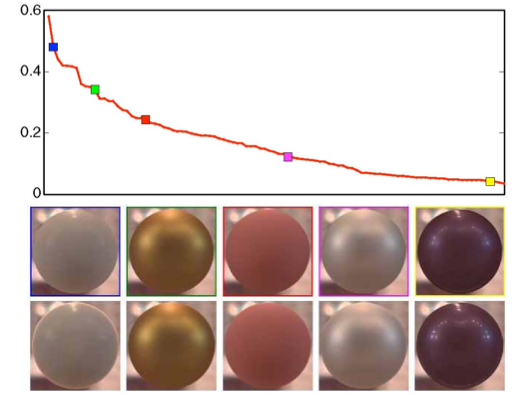 The lobe decompositions clearly visualize the distinct reflectance characteristics of individual lobes, e.g., the color is solely encoded in the third lobe for the bottom two materials indicating body reflection. Results of modeling the BRDF of polyoxymethylene plastic with a three-lobe DSBRDF model. (First column) Synthetic spheres rendered with (top) measured BRDF and the (bottom) three-lobe DSBRDF model. (Second column) DSBRDF model (solid curves) fit to normal incident light slices of the measured BRDF data (squares), shown as the 1D profile on the incident plane for the red, green, and blue color channels. (Third column) Lobes (red, green, blue curves) of a three-lobe DSBRDF model (black solid curve) fit to measured data (black dots). (Fourth column) Synthetic sphere rendered with the DSBRDF model parameters for each lobe separately. Note that the second lobe (corresponding to the blue curve in the third column) encodes the body color while it exhibits specular reflection, which cannot be modeled with conventional dichromatic models. We can extract the linear subspace spanned by real-world BRDFs in the otherwise highly nonlinear and high-dimensional space by analyzing the principal components of the parameter values of our reflectance model. Here we project each BRDF onto the first two bivariate eigenfunctions obtained via FPCA on the (\kappa, \gamma)-curves computed by representing each BRDF, as a whole, with a DSBRDF model with the optimal number of lobes. Note the natural clustering in this low-dimensional embedding of the BRDF space, with pure-diffuse surfaces located in a tight cluster in the upper right-hand corner. Metallic surfaces are scattered toward the left, and plastic surfaces are scattered toward the bottom. These results suggest that the DSBRDF model provides a sound foundation for extracting physically meaningful low-dimensional bases for encoding the otherwise massively high-dimensional space of real-world BRDFs. © 2019 Kyoto University Computer Vision Lab. Powered by Jekyll & Minimal Mistakes.